Don Howard is the Director of the University of Notre Dame’s Reilly Center for Science, Technology, and Values and a Professor in the Department of Philosophy. With a first degree in physics (B.Sc., Lyman Briggs College, Michigan State University, 1971), Howard went on to obtain both an M.A. (1973) and a Ph.D. (1979) in philosophy from Boston University, where he specialized in philosophy of physics under the direction of Abner Shimony. A Fellow of the American Physical Society, and Chair-Elect of APS’s Forum on the History of Physics, Howard is an internationally recognized expert on the history and philosophy of modern physics, especially the work of Einstein and Bohr. He served as Assistant Editor and Contributing Editor for The Collected Papers of Albert Einstein (Princeton University Press), and is Co-Editor of the Einstein Studies series (Springer). His video/audio lecture series, Albert Einstein: Physicist, Philosopher, Humanitarian, is available from The Great Courses, and a collection of his essays on Einstein is in preparation for the University of Chicago Press. Howard is also the co-founder (1990) of the International Society for the History of Philosophy of Science and co-editor of its journal, HOPOS (University of Chicago Press). 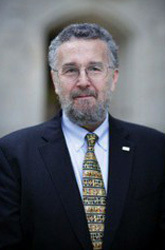 Howard has been writing and teaching about the ethics of science and technology for many years. Co-editor of the recent collection, The Challenge of the Social and the Pressure of Practice: Science and Values Revisited (University of Pittsburgh Press), Howard has led NSF-funded workshops on science and ethics at Notre Dame for physics REU students, and has taught courses on topics ranging from the moral choices of atomic scientists during World War II and the Cold War, to the ethics of emerging weapons technologies. Among his current research interests are ethical and legal issues in cyberconflict and cybersecurity. Don Howard. The Challenge of the Social and the Pressure of Practice: Science and Values Revisited. Co-edited with Martin Carrier and Janet Kourany. Pittsburgh: University of Pittsburgh Press, 2008. Don Howard. “Better Red than Dead – Putting an End to the Social Irrelevance of Postwar Philosophy of Science.” Science and Education 18 (2009), 199-220. Don Howard. “Physics as Theodicy.” In Physics and Cosmology: Scientific Perspectives on the Problem of Natural Evil. Nancey Murphy, Robert Russell, and William Stoeger, S.J., eds. Vatican City: Vatican Observatory; Berkeley: Center for Theology and the Natural Science, 2007, pp. 323-332. Don Howard. “Two Left Turns Make a Right: On the Curious Political Career of North American Philosophy of Science at Mid-century.” In Logical Empiricism in North America. Alan Richardson and Gary Hardcastle, eds. Mnnneapolis: University of Minnesota Press, 2003, pp. 25-93.